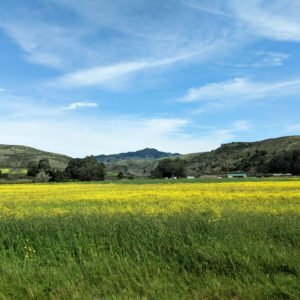 Whenever we’re searching for an Airbnb in a city and coming up short, one of our favorite strategies is to zoom out just a touch. Airbnb gems tend to cluster within an hour of our initial parameters. This is how we found the fabulous carriage house on the Sunshine Coast across the bay from Vancouver. It’s how we stumbled upon this serene farm an hour outside of Nashville. 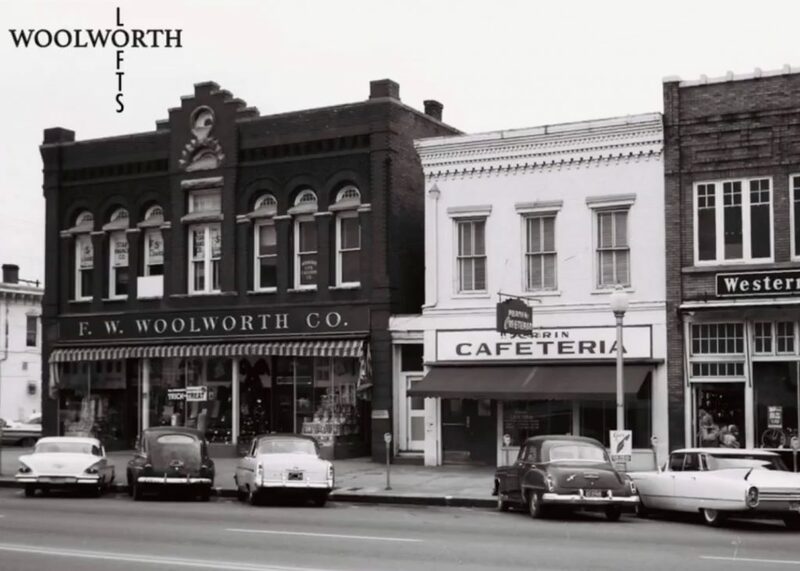 And it’s how we discovered the incredible Woolworth Lofts in downtown Selma, Alabama. 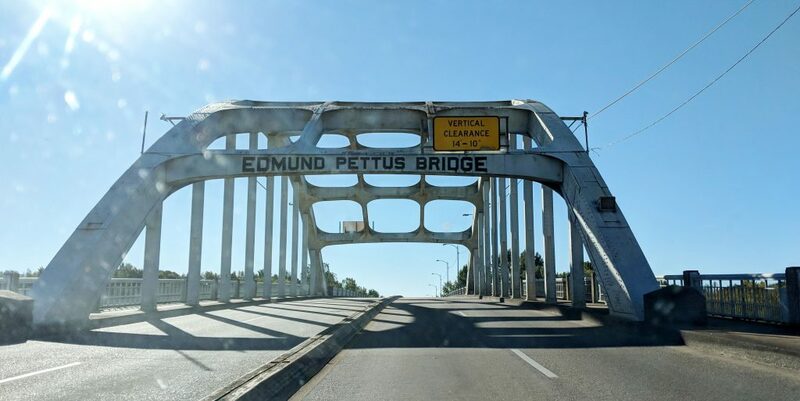 Following the same 54-mile stretch of highway that the Civil Rights activists took east during the Selma to Montgomery March of 1965, our travels took us west from Alabama’s capital, across the infamous Edmund Pettus Bridge, and into the heart of Selma. 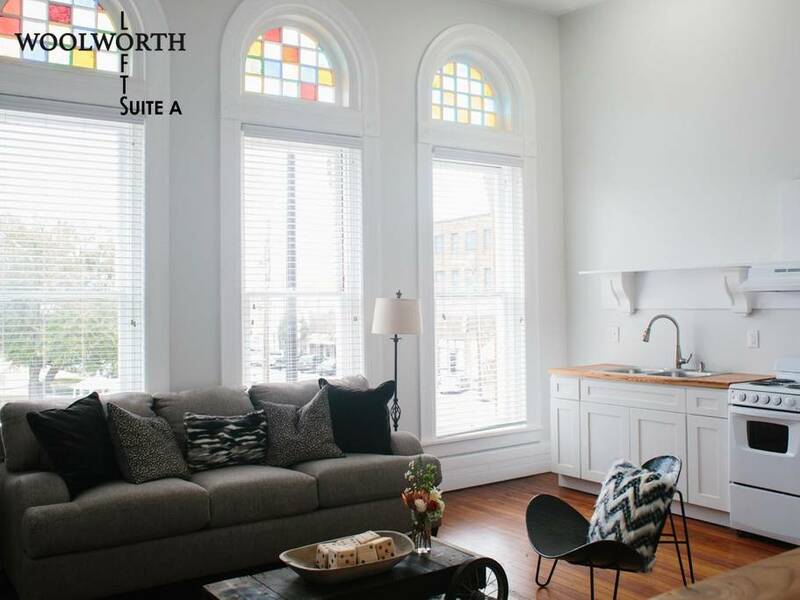 Here we climbed a steep flight of stairs and entered one of the five stunningly renovated suites that make up the Woolworth Lofts. 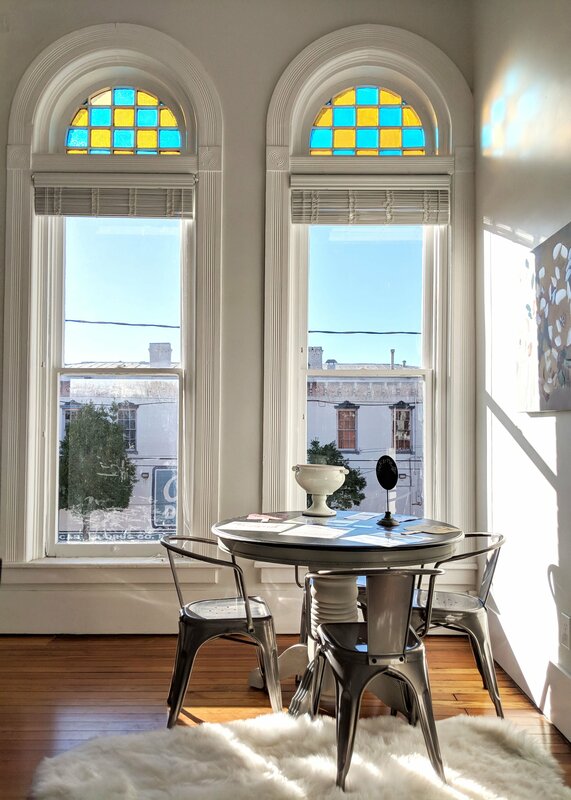 Whether you’re following the Civil Rights Trial, visiting family or friends, or are just traveling through the area, Selma is ready to welcome you with one of the best Alabama Airbnbs. 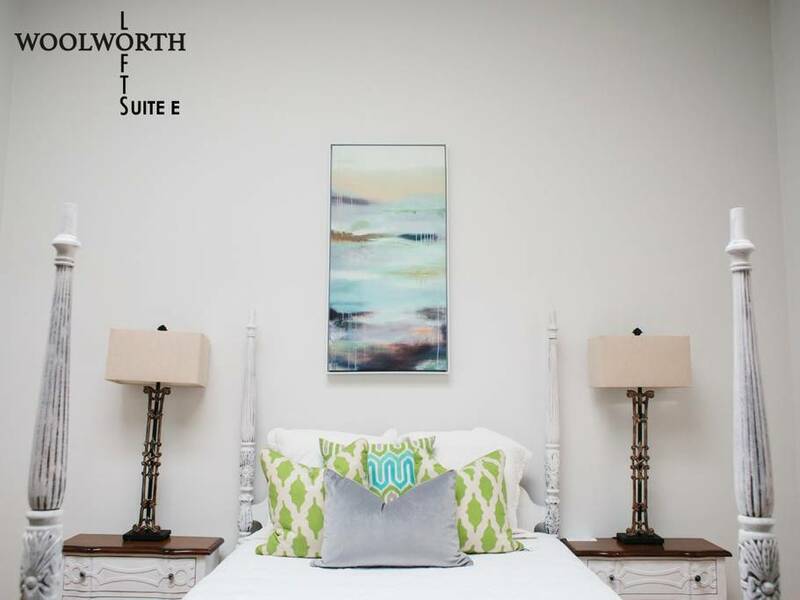 From her voice to her signature, A.C.’s upbeat personality can be felt throughout the Woolworth Lofts. And her dedication to her town is unmistakable. 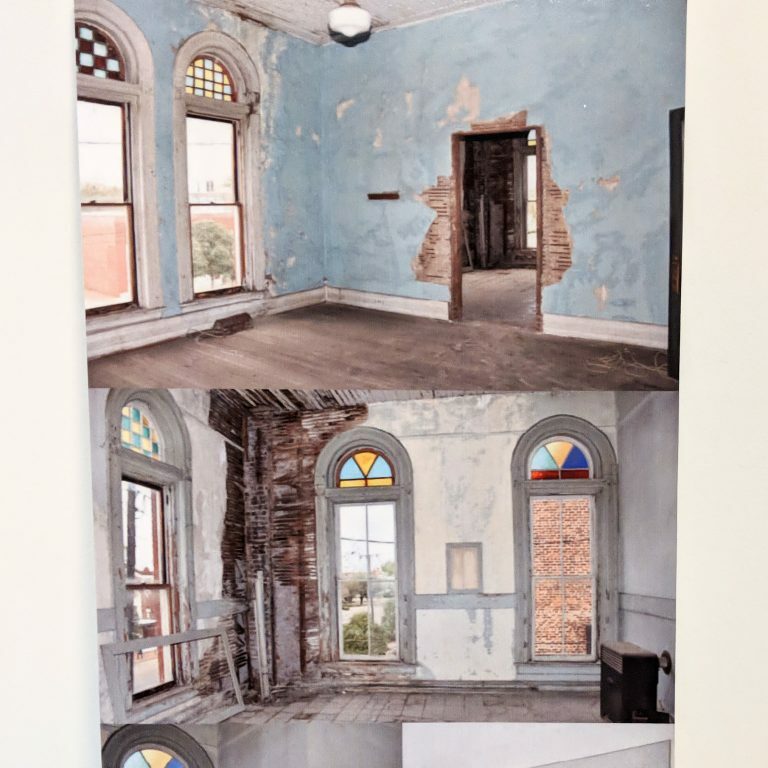 A local realtor, A.C.’s transformation of a dilapidated 110-year-old building into a spectacular collection of Airbnb suites was an investment in Selma itself. 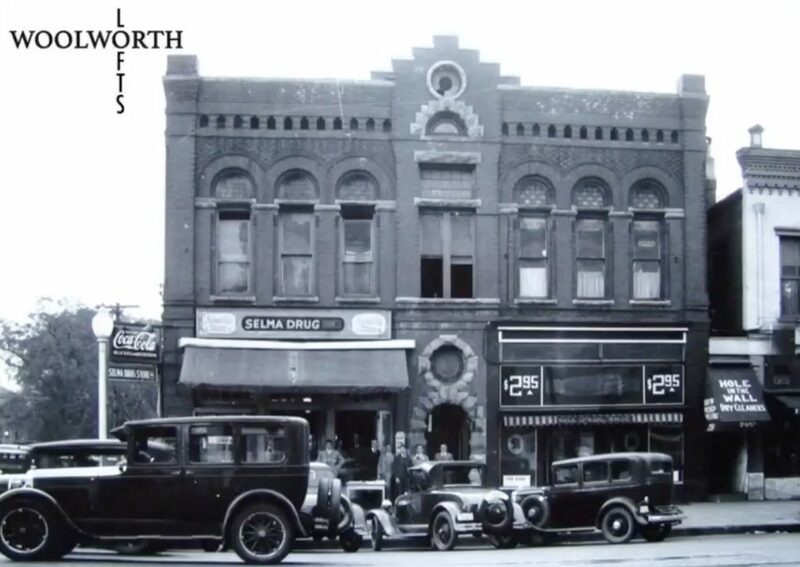 Once a stately Woolworth department store, this corner building on the town’s main drag had fallen into deep disrepair. 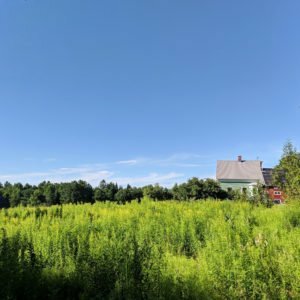 In March of 2018, the building reemerged transformed. 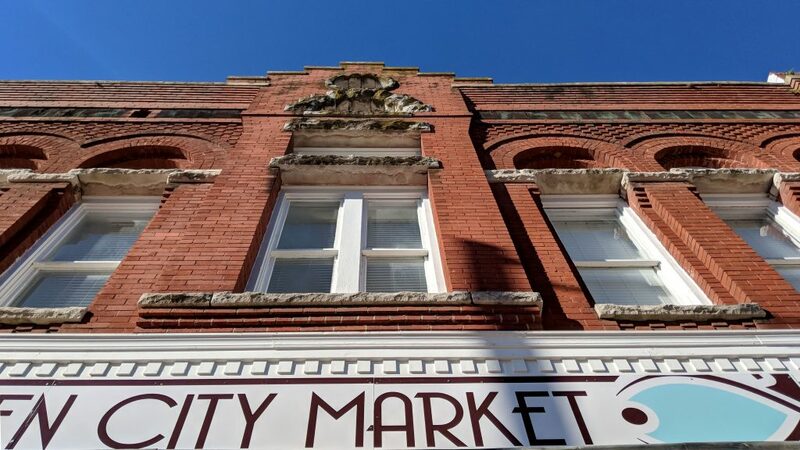 An adorable local boutique, the Queen City Market, now fills the ground floor and visitors like us head upstairs to make Selma our temporary home. 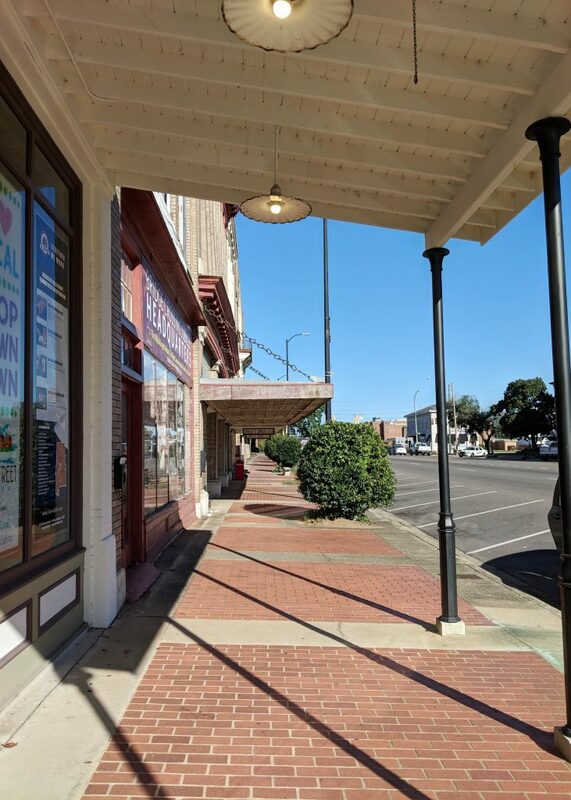 According to the Selma Times-Journal, this was A.C.’s goal from the start: to get folks to spend more time in town by creating a beautiful place to stay. 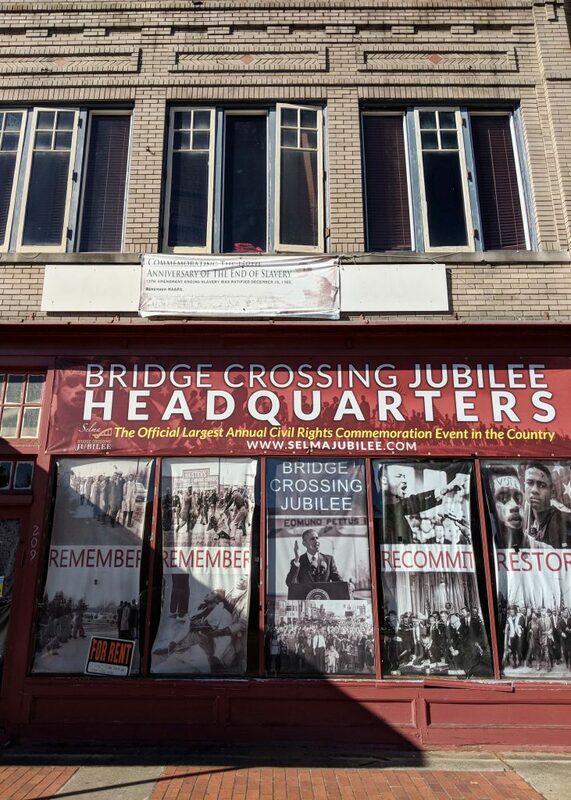 “If people stay with us for a week,” A.C. said, “they fall in love with us.” In a matter of months, A.C. racked up hundreds of glowing reviews, drawing visitors like us away from Montgomery and into the center of Selma with these brilliant lofts. 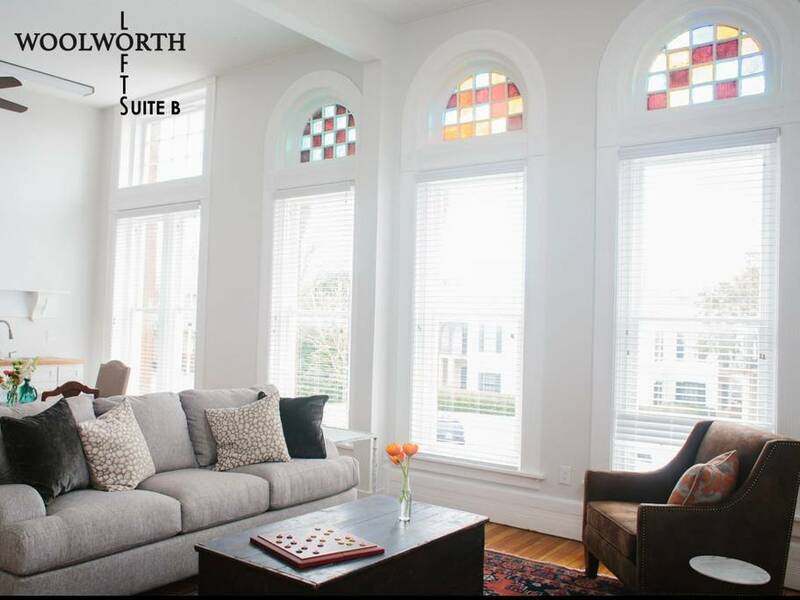 Connected by a long interior hallway, the five suites that comprise the Woolworth Lofts line the second story of a grand brick building overlooking downtown. With floor to ceiling windows topped with half moons of stained glass, natural light soaks each suite. Polished hardwood floors accentuate bright white walls, and the ceilings float high above. Each loft has its own personality, offering different variations on a central theme. While most include a queen bed perfect for solo travelers or couples, Suite F is cleverly outfitted with two twin beds, making it ideal for platonic traveling buddies or a family renting one suite for the parents and another suite for the kids. After excessive online deliberation (it was so hard to choose! 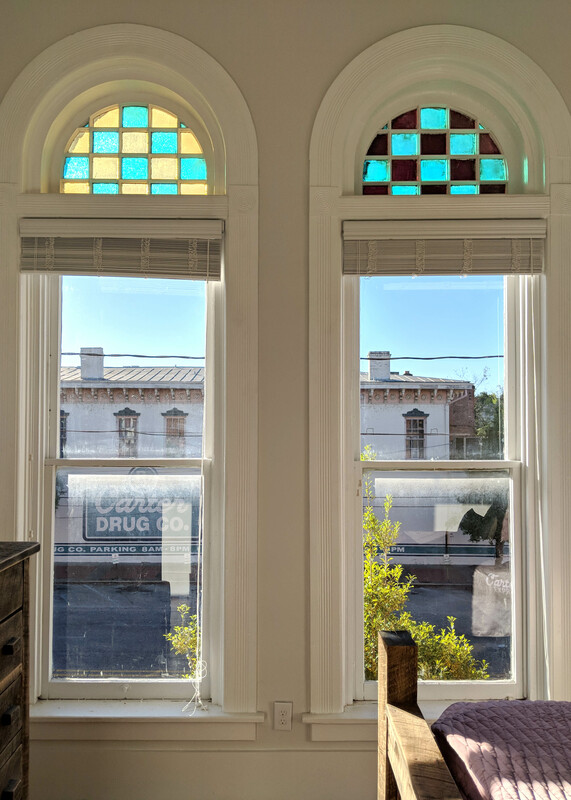 ), we booked our stay in Suite C. With its southeast windows and queen-sized bed, it was the perfect stop on our southern road trip. 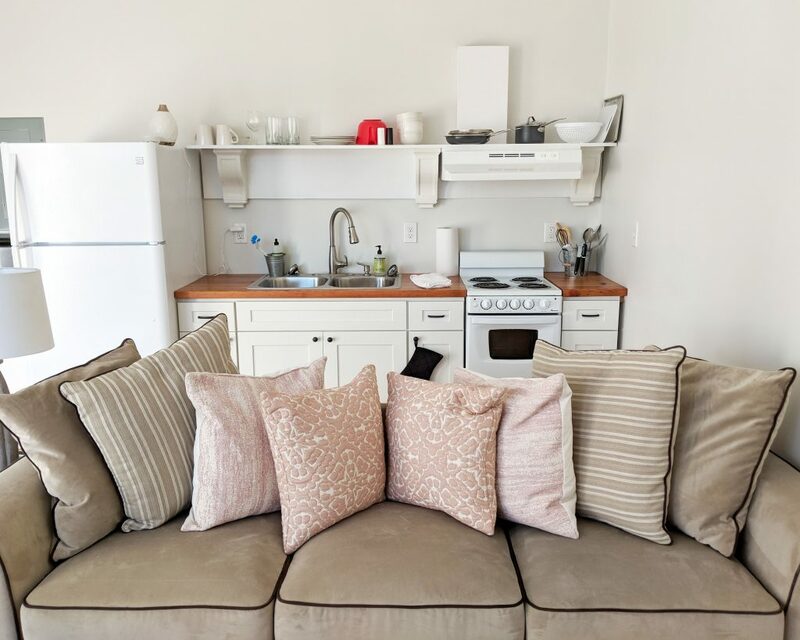 A couch filled with plush pillows created separation between a seating area and the kitchen lining the interior wall. 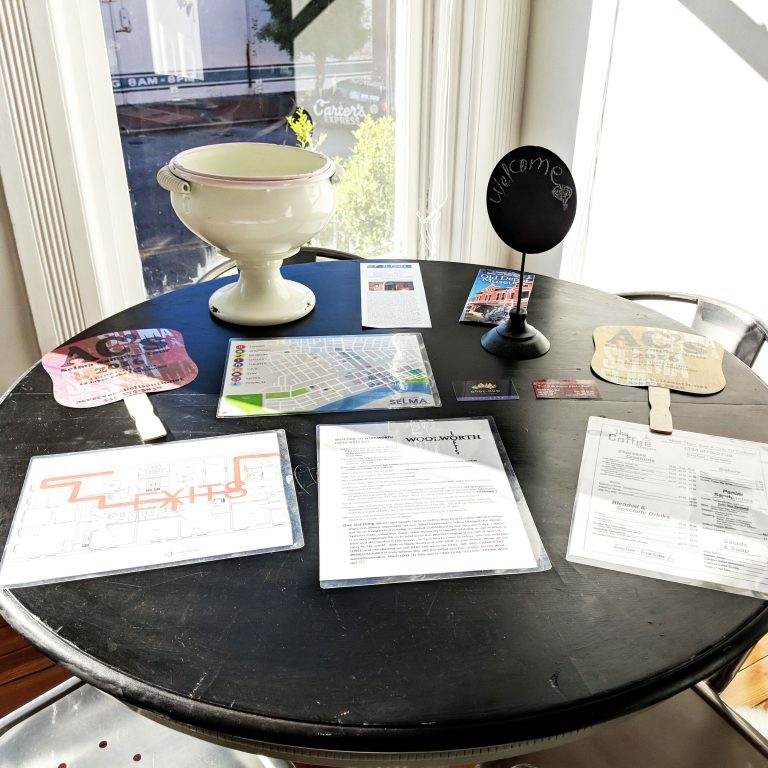 A dining room table was nestled next to the windows, covered with information about exploring Selma. Tucked behind their own doors, an enclosed bedroom and bathroom invited us to settle in. Baked into each Airbnb stay are the thoughtful amenities and generous personalities of our hosts. 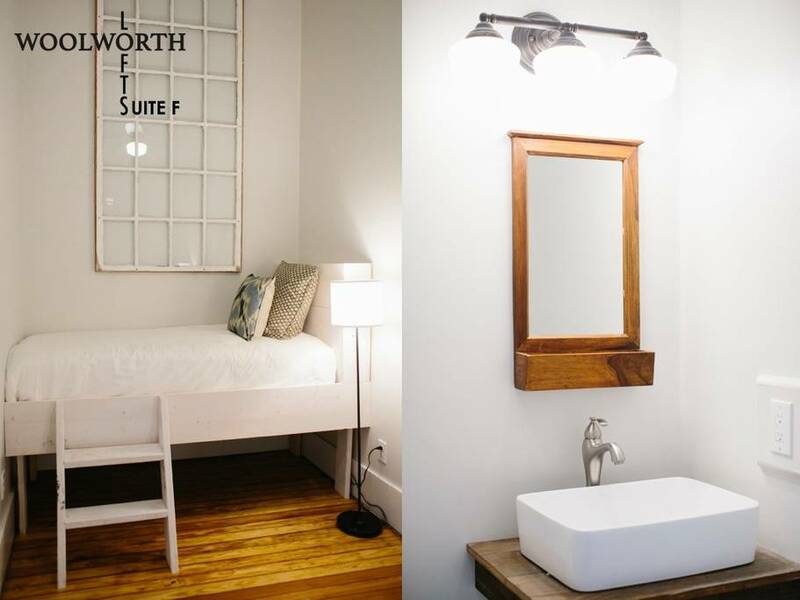 At the Woolworth Lofts, here were the personal touches we loved most. Throughout the hallway, A.C. had placed photos of the building before the renovation had begun. The space was unrecognizable. We loved these photos. The ability to see the suites at their worst enabled us to truly appreciate the transformation that A.C. had spearheaded. Primed with this perspective, we admired our suite that much more each time we walked through the door. The elongated windows were unequivocally the centerpiece of each room. And the crown jewel of each window was the arc of stained glass at the top. A checkered pattern of jewel tones invited the sunshine into the loft even when the blinds over the main windows were still drawn from the night. We woke up basking in gentle splashes of sherbert and teal. What a way to start the day! In the midst of white light and neutral furniture, the suite’s color palette emerged from the blurred geometric lines of an exquisite painting above the tv. Soft pinks and muted salmons were shaded with deeper purples and mauves. This painting made its way throughout the suite, inspiring fabrics and additional art, while accentuating the loft’s towering ceilings. The suite was bursting with throw pillows in the best way. (Who wouldn’t want to belly flop on such an inviting bed? After all, that’s the best indicator of a perfectly made Airbnb bed.) At night though, we tend to keep a one pillow per person ratio, which means we need a place to set the pillows when we crawl into bed. We loved that A.C. had left nearby surfaces clear and ready. Otherwise, these beautiful pillows just end up on the floor. Or rather fluffy ottoman books? 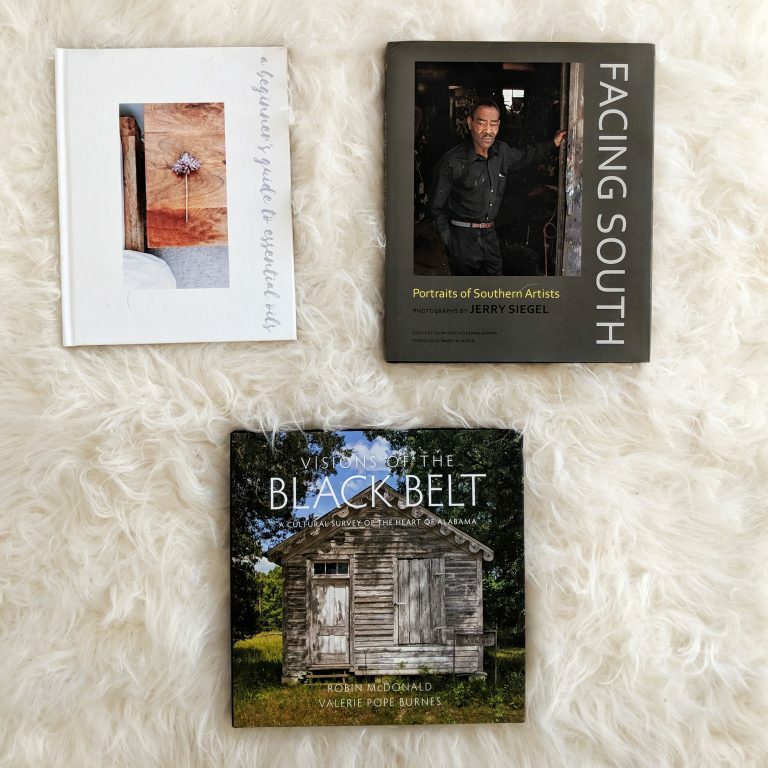 We love when hosts have set out oversized photo books, especially when they give us insight into the place we’re visiting. Here, we learned about Alabama’s Black Belt, a crescent shaped collection of counties with a rich layer of topsoil. This geographical feature led to the historically dense concentration of cotton plantations and slavery in the region. 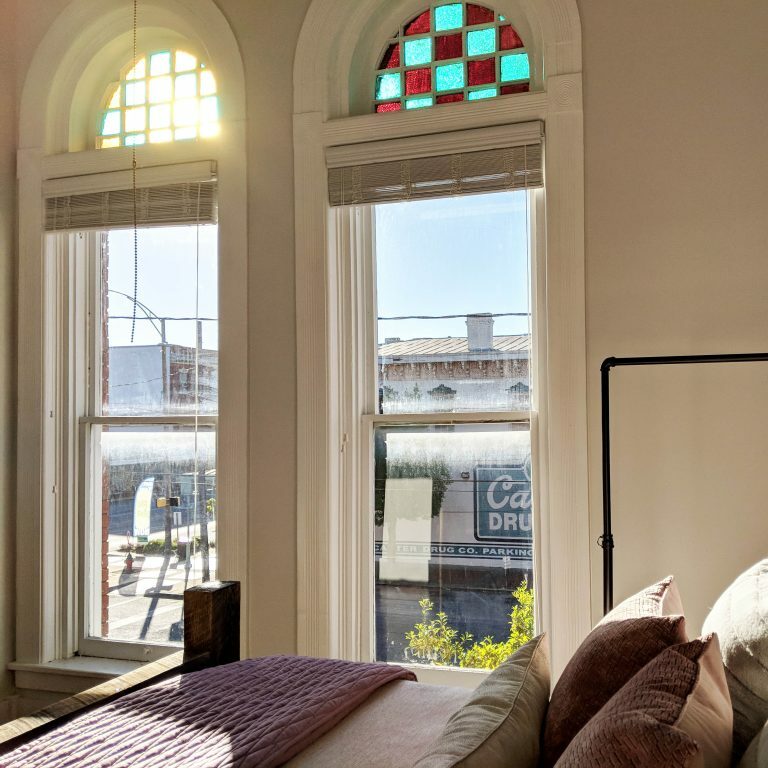 Included in the loft’s welcome information, A.C. wrote: “We are a very new Airbnb and our motto is: ‘Imperfectly Striving for Excellence!’ Please let us know how we can do better!” Now that might just be the most genuine request for guest feedback we’ve seen yet. We wouldn’t change a thing, but the gesture made us feel so valued and welcome from the moment we set down our bags. 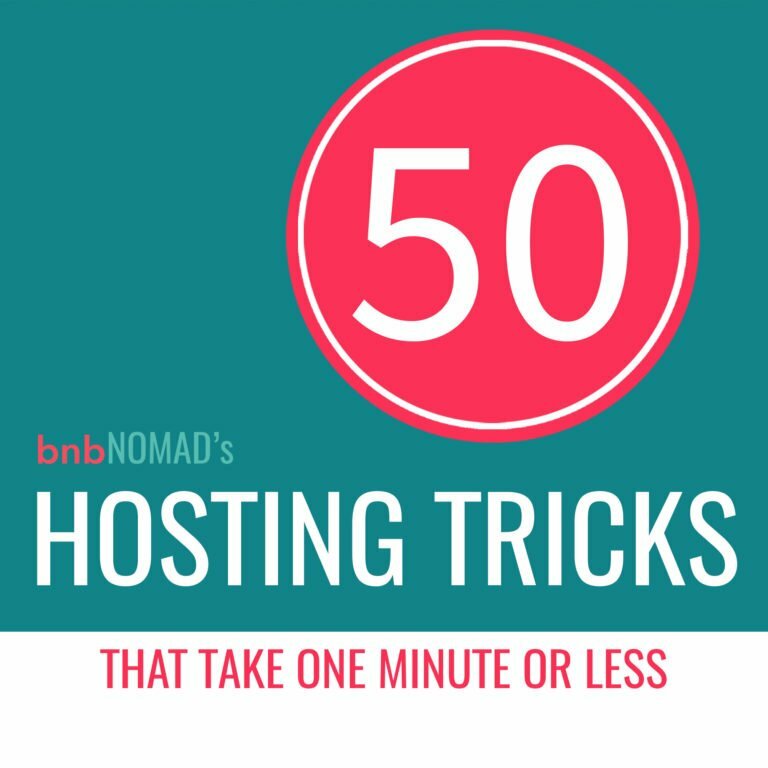 This may be A.C.’s first year running her Airbnbs, but there’s nothing novice about her hosting style. 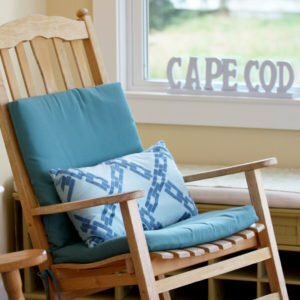 If you’ve got an Airbnb of your own, here are the clever tricks we adored most as guests. There’s a fine line between engaging heirlooms and repellant antiques. 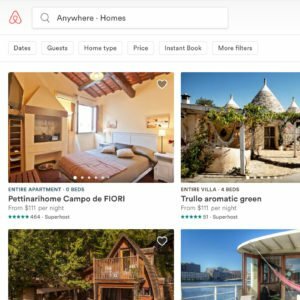 Airbnb guests want to soak up the history of a space, but they also want to enjoy all the contemporary amenities they’d find at a great hotel. 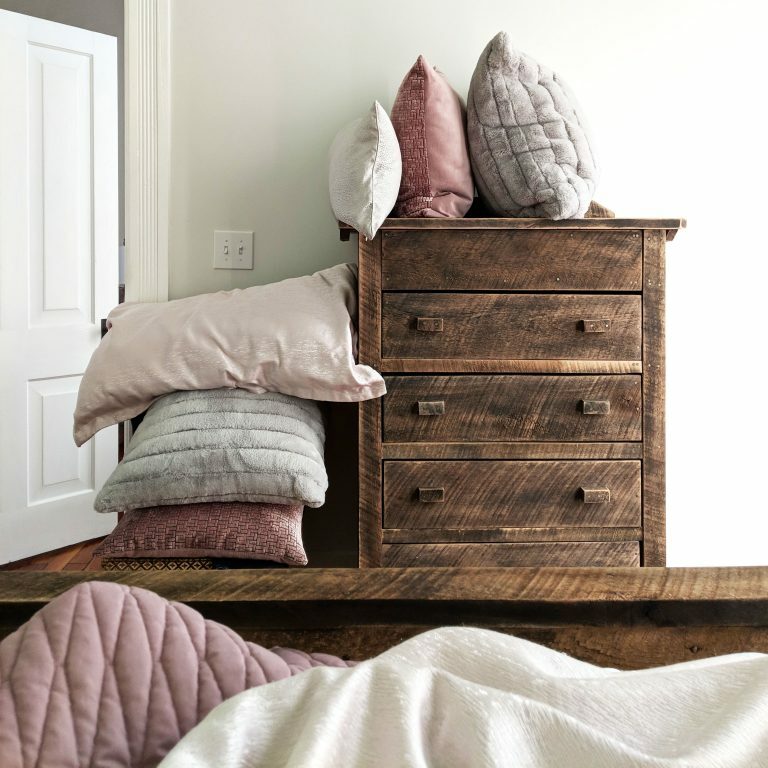 The brick fireplace or ornate molding might be old, but the mattress and linens certainly shouldn’t be. A.C.’s renovation walked this tightrope with impeccable grace. She kept the building’s historic fingerprint beautifully intact. Light streamed through the original stained glass, the walls stretched up into vaulted ceilings, the door knobs boasted their art deco geometry, and the glass pane above each suite could still be opened with its thin rod and metal hinge. And in the same breath, the shower was new, the pillows were fresh, and a Keurig was positioned on the kitchen counter. That, ladies and gentleman, is how it’s done. The Woolworth Lofts are stitched together with a cohesive tone, but the suites we considered online also had their own unique flair. Each was decked out with memorable accents, linens, and furniture that fused classic comfort with modern swagger. 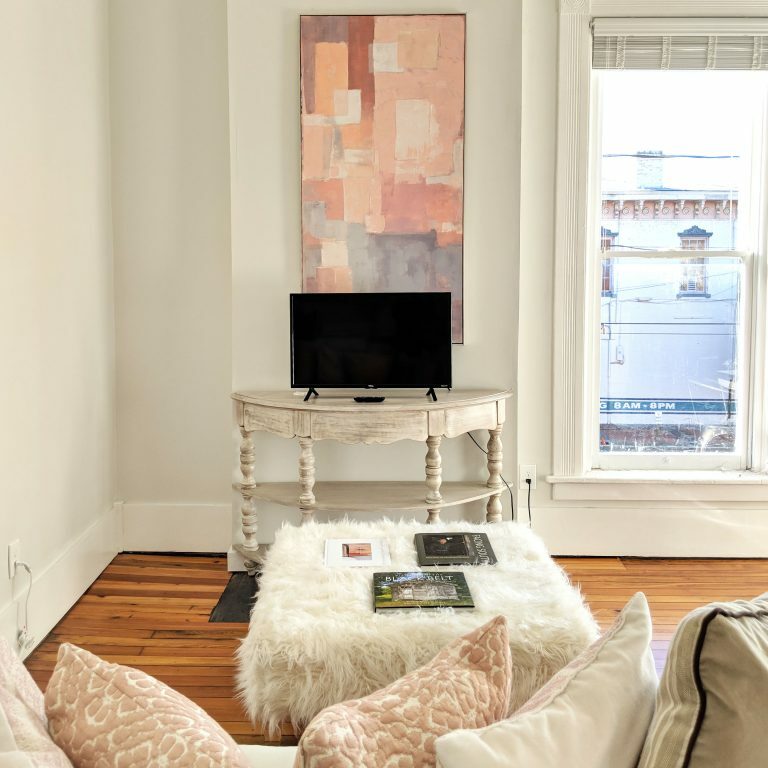 If you’re a host looking to outfit or update your Airbnb, take A.C.’s approach and partner with an interior design expert. It turns out that adorable boutique beneath the lofts, the Queen City Market, was the inspiring source of the loft’s signature interior design. 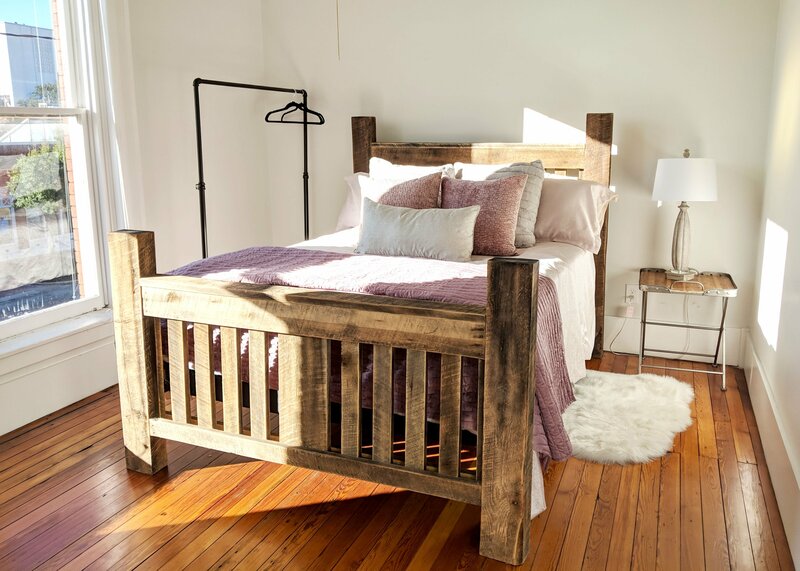 By leveraging the curated collection and expertise of owner Mandy Henry, the lofts brought this exceptional style upstairs. 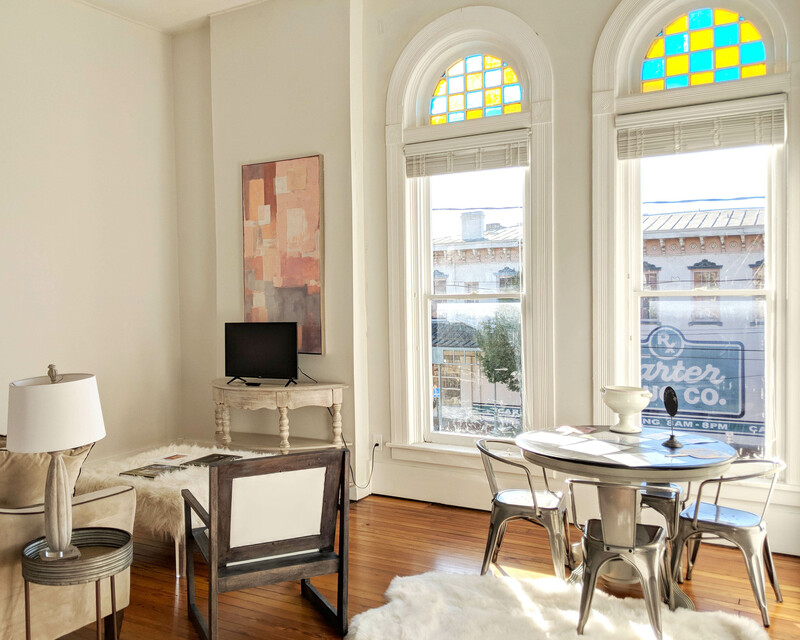 In turn, the lofts stood out online and hooked our interest as we searched for an Alabama Airbnb. 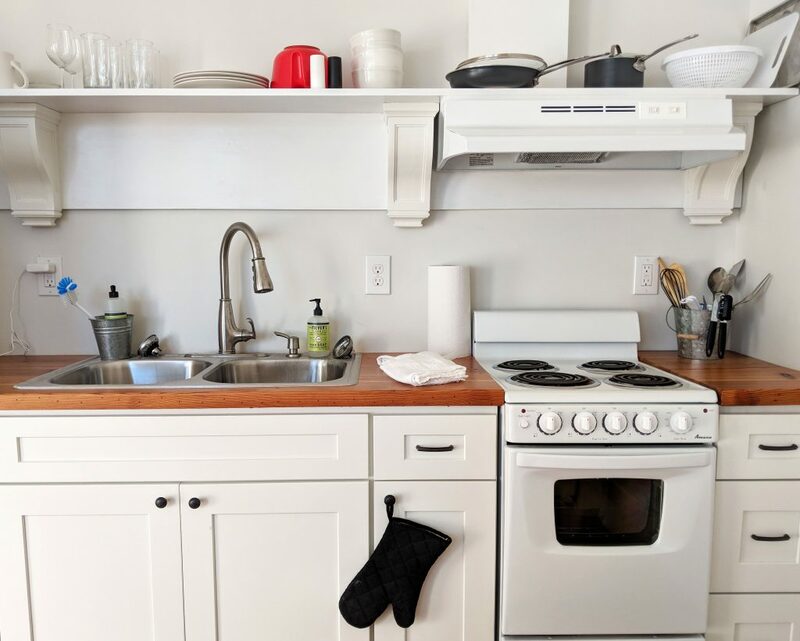 To Airbnb guests, bright white means super clean. And nowhere have we seen more white than here: the walls, the ceilings, the tub, the towels, just about the entire kitchen. There were even downright gutsy uses of white. The entire ottoman was a fluffy cream.The plush rug under the table–that’s right, where guests eat!–was bright white. If you’re a host looking to demonstrate just how spotless your Airbnb really is, highlight this cleanliness with bold uses of white. Just be sure your vigilance is up to the task, like A.C.’s. 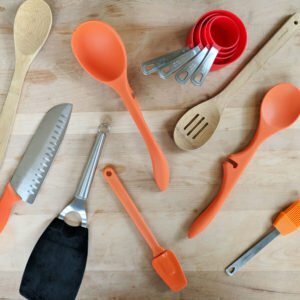 Otherwise, the intended effect of these accents will flip, and they’ll just highlight the need for a good Airbnb spring cleaning. Check out A.C.’s hosting station just down the hall from the lofts. Is that inspiring or what? 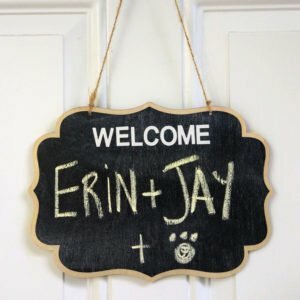 As guests, we can feel when we’re in good hands, which usually means we’re actually in a good system. Thoughtfully designed processes create consistent five-star results, and hints of this hosting operation’s inner workings were all around: the tourist information was laminated, the towels were rolled up just so, the throw pillows were perfectly plumped, the check out information was pinned at eye level on the inside of the loft’s door. These details don’t just happen. The time has been invested upfront in getting organized and establishing productive systems. Then the glowing reviews started to flow in like clockwork. Unless you need to avoid a steep staircase, we’d recommend the Woolworth Lofts to just about anyone. 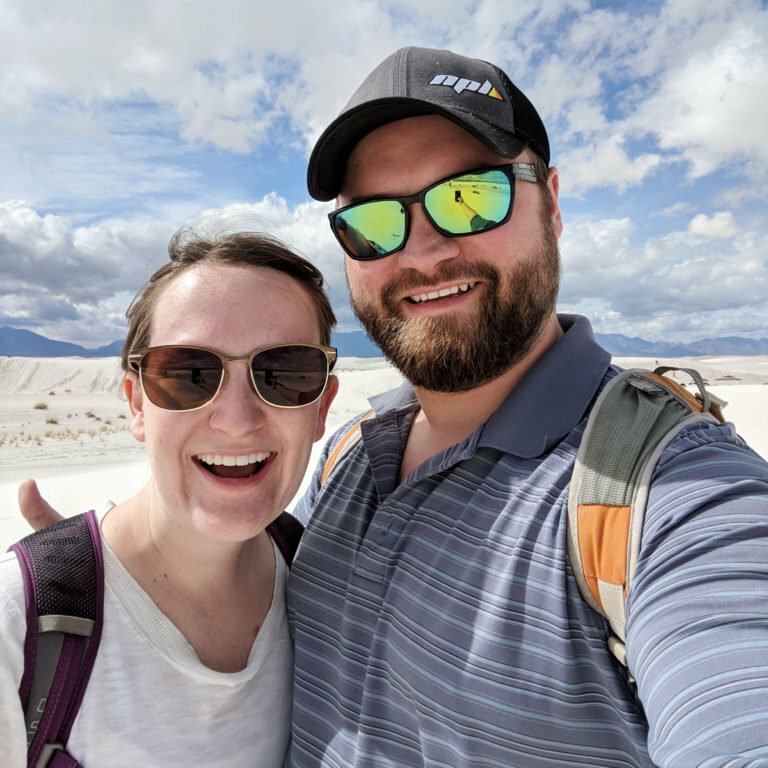 We’d especially encourage travelers like these to book this fabulous Alabama Airbnb.